Ques. 1: How do we understand the affair of a Muslim who died upon Tawheed but he has purposely killed another Muslim? How can this person (murderer) leave the hellfire especially due to the fact that a severe punishment is mentioned in the Quran with the mentioning of the hellfire, and remaining in it, and the curse and anger of Allah upon such an individual? Please benefit us in this regard, may Allah reward you. The Sunnah has also warned the believer from purposely killing his believing brother. If a person does happen to fall into this action, then he will receive a legislated governed punishment (by way of the rulers) in this life as long as the guardian or relative of the murdered individual does not pardon the murderer. If, on the other hand, he pardons the murdered, he (the guardian or relative) will receive a reward, but if he chooses for the blood money to be paid, it would then be paid to him, but the murderer must still repent to Allah (even if the blood money is paid). Therefore Allah has named the killer and the guardian of the murdered individual brothers to one another. Consequently, if the killer was a disbeliever, Allah would have not named him a brother to the guardian of the murdered individual. The third point which is related to this answer is what is mentioned concerning ‘khulood’ (remaining in the hell-fire). There are two meanings of ‘khulood’. The first meaning is to remain in the hell-fire for eternity; this meaning applies to the disbeliever and the polytheist. The second meaning indicates dwelling in the hell-fire for a long period of time. This applies to the person who meets Allah while indulging in a major sin which he has not repented from, such as purposely killing another believer. There are two punishments for intentional killing; the first of these punishments is expiated by way of repentance, which expiates the punishment that a person would receive on the Day of Judgement. The second punishment, which is conducted by the ruler, this punishment can only be expiated if the guardian of the murdered individual pardons the killer. And indeed Allah knows best. Question.3: How do we understand that some scholars praise an individual, but other scholars of the Sunnah warn against that same individual? Ans: This situation has two ways of occurring, or three. 1. The scholar who praised this individual is unaware of what or why the other scholar has dispraised him, and therefore he continues to view him as someone reliable and trustworthy until knowledge comes to him about the reason for dispraise. Once knowledge does reach him, he will never persist to praise this individual. That which is known from the scholars of the Sunnah is that if reason for dispraise is justified, they will not hesitate to do so. An example of this is the story where Imam Ahmed abandoned Dawud bin ‘Ali (may Allah have mercy on the both of them), and he (Imam Ahmed) refused to visit him. What was his reason for doing so? Because Imam Muhammad bin Yahya al Dhuhlee (may Allah have mercy on him) wrote a letter to Imam Ahmed informing him that Dawud bin ‘Ali held the belief that the Quran was created, and Imam Ahmed accepted this information because he held Imam Muhammad bin Yahya to be trustworthy and reliable. He (Imam Ahmed) did not seek proof from Imam Muhammad bin Yahya because he held him to be reliable, he likewise did not say: Do others agree with you in that which you have mentioned about Dawud bin ‘Ali? This story clarifies the falsity of the belief that there must be a complete consensus of the scholars in order to justify the dispraise of an individual. This (false opinion) is one of the foundations which is supported by the followers of ‘Ali bin Hasan al Halabi. 2. The praise is limited (to a specific action or characteristic of the dispraised individual). This form of praise does not contradict what has been mentioned of dispraise of the person. That which contradicts the dispraise is a general, broad praise. For example: If an Ash’aree, Matroodi, or even a Mu’tezillee was correct in a number of his statements, we would say that his statements are correct and true and we are grateful to him because of his correctness. This praise is limited to his statement of truth, and it is not a general, broad praise. As for the general praise, the people of the Sunnah do not apply this type of praise to the people of innovation because doing so would bring about confusion to the one who hears or reads such praise, but as we mentioned previously, this could possibly take place if the information pertaining to the dispraise of an individual has not yet reached the scholar, or it has actually reached him but it was presented in a manner which is unclear. However if the clear, certain proof has reached the scholar who is upon the Sunnah that a particular person has been dispraised, he would indeed not hesitate to agree, as I previously mentioned to you, and the proofs to support this are many. Therefore it is mandatory that a person adheres to all of the aspects of the Sunnah which he has knowledge of. Hence, if a person abandons a Sunnah that he is aware of, and instead chooses to practice an innovation, while being fully aware of it, he is certainly not considered a person of the Sunnah. The original question was if the masjid has a qabr or a grave is it permissible to pray in it. So Shaykh Ubayd (hafidhahullah) he went on after praising Allaah and saying peace and blessings on the Messenger and his family and companions, he went on to say in regards to this question that there are basically two situations. The first of them is that, if the grave came before the masjid, and the masjid was built because of the grave being there and was built so that the people would worship the person who was in that grave, worshipping besides Allaah. And the Shaykh goes on to mention that there is a severe threat in regards to this affair. And he went on to mention some of the nusoos, some of the texts in regards to that, like the saying of the Messenger (sallalhualahi wa sallam) that the anger of Allaah is upon the people who take the graves of the Prophets as masaajids. And in another narration, that the Prophet (sallalhualahi wa sallam) asked for curse of Allaah to be upon the Jews and Christians, because they took the graves of their Prophets as Masaajids. So the Shaykh went on to say that there are many hadith on this issue. So he said in regards to this, that it is not allowed to pray in it, because this masjid was built, because of the grave, because it was built, to worship other than Allaah. So the Shaykh said in this situation, then it is not allowed to pray in the masjid. Then the Shaykh mentioned a second situation and that is, if the masjid is built and the grave is built inside the masjid intentionally. So the Shaykh went on to mention that there are two things that can be done in this case. Then one of them, that a wall or separation is built to separate the grave from the masjid; or the second situation that the grave is taken out of the masjid and the person who was in the grave and buried along with the other Muslims. So then the Shaykh was asked, what is the case if the grave remains inside and not separate from the masjid, then the Shaykh said then it is not allowed to pray in it. It is not allowed to pray in this masjid. As-Salafiyyah in the Arabic Language Means: Ascription to he who has preceeded; meaning passed by. In its legislative usage, it is: All those who have passed after the Prophet Peace be upon him (following) his tracks; from the companions, the Imaams amongst the Taabi’oon (successors of the companions), and those after them. Know, may Allaah bless you, that no one from the human beings in any time or place founded Salafiyyah. So Shaykh Muhammad ibn ‘Abdul-Wahhaab along with his brother Imaam Muhammad ibn Sa’ood were not the founders of Salafiyyah. Nor was anyone before them from the people of knowledge and the Imaams of the religion and the true callers to this monotheistic religion its founder; such as Shaykhul-Islaam Ibn Taymiyah and his students, and those who were before him; such as the four Imaams and those who we have named from the Imaams; nor from the Taabi’oon, nor from the companions of Muhammad nor was Muhammad. Nor was it anyone who came before him from the Prophets and Messengers, upon all of them be prayers and peace. Rather, it is from Allaah. The Prophets and Messengers brought it. They conveyed that which He wished from the worship legislatively; as did those who came after them from their companions and followers. So whoever came after them were callers to Allaah in conformity with this Salafiyyah. This idea of proving Islam through the Sciences is a bid’ah (an innovation). This type of study keeps us away from learning the true religion. My sincere advice to you my sister in Egypt, and other sisters of the Sunnah in Egypt, is that you shouldn’t listen to this and must not busy yourselves with this knowledge but rather you should focus on the knowledge of the Sharee’ah which is the knowledge of the Qur`aan and the Sunnah upon the understanding of the Salaf. The Sunnah is a way of happiness and tranquillity in this life because the Prophet sallallahu ‘alayhi wa sallam said: Whoever Allaah wants good for, He gives him understanding of the religion. So from this, we understand that whoever Allaah does not want good for, He does not give him understanding of the religion. Shaikh Ubayd al-Jabiree giving an important advice to those Salafiyun who are deficient in their dealings with others. This questioner asks on the ruling of putting personal pictures as a member on websites especially on Facebook and Twitter? I say that the pictures of souls are haram and it is from the kabaa’ir (the major sins). And he, [salla Allaahu ‘alayhi wa sallam], also stated that the image maker will be presented with an image and it will say ‘Blow a spirit therein, which he will not be able to do’. And from this we know that it is not permissible to publish pictures (images) of people in Twitter or other networks. When the agency responsible (for the networks) request a picture for a specific matter such as licences (for traffic) and security (passports etc) and other authority bodies that employs a person, then it becomes necessary or in need of. And it cannot exceed further than this. Muwahhideen Publications in conjunction with al-Ibaanah.info of Germany organized a LIVE Tele-Lecture with the Noble Shaykh al-Waalid al-Allaamah ‘Ubayd ibn ‘Abdillaah al-Jaabiree (May Allaah Preserve Him), from the major scholars of Madinah, Saudi Arabia on the etiquettes of ‘Eid ul Fitr and Zakat ul Fitr, on Saturday 12th August, 2012. This event was broadcast LIVE in Masjid Ibn ‘Abbaas, Tobago, two masaajid in Trinidad, Masjid ul Khaleefah and Masjid us Sunnah, and four Masaajid in the U.S. Masjid Al-Bukhaari, Florida, Masjid Ibn ‘Abbas, Georgia and Masjid Uthaymeen, New Jersey, and Masjid Nur Allaah, NY. This lecture event was translated afterwards into English. Our Shaykh ‘Ubayd al-Jaabiree (hafidhahullaah) started off by making du’a that Allaah, The Lord of The Mighty Throne complete this month for us, keep us upon the Straight Path and keep us upon rushing to do what is good and racing one another in all permissible actions for as long as we live. Next he touched on some of the intricacies of Zakaatul Fitr and went on to explain the reasons for its various names. The Shaykh also addressed the important issue of giving Zakaatul Fitr in the form of money and its ruling according to the Shari’ah. The lecture continued with the Shaykh explaining the matters of the etiquettes of ‘Eid and Zakaatul Fitr. Ques. 2: If a Muslim falls into a sin or an innovation, is it mandatory that other Muslims advise him before abandoning his company? Ques.3: How do we understand that some scholars praise an individual, but other scholars of the Sunnah warn against that same individual? Ques.4: Is it mandatory that a student of knowledge holds a degree from an Islamic university or a recommendation from a scholar, if he wishes to teach the religion to the people? Ques.5: What is your advice for a person who has been affected by the lessons and talks of Shadeed Muhammad, and he holds the opinion that he is upon the truth even if the esteemed scholars and well-known students of knowledge speak ill of and dispraise him, what is your advice for this person? Ques.6: It has become apparent in our present times that many people have deviated from seeking knowledge and instead have become very much indulged in earning wealth. It’s possible that some of them were more diligent in seeking knowledge and performing righteous deeds before they came to Saudi Arabia, but after arriving, many of these individuals no longer attend the lessons of the scholars, nor do they seek knowledge. What are the reasons for this, and what are the remedies, may Allah preserve you? Ques.7: Does the previously mentioned person move from being a student of knowledge to being classified as a general layman in order that the people are not mislead by his lack of knowledge? Ques.8: How does a person combine between earning wealth to support his family, and seeking knowledge? Ques.9: A female notices small or large amounts of blood one or two days before the coming of her normal menses. Then this blood stops for a period of a day or two, and then her menses comes and after some time she sees a sign of purity, or at times, she doesn’t see a sign of purity, but the bleeding stops. What should she do in this case? 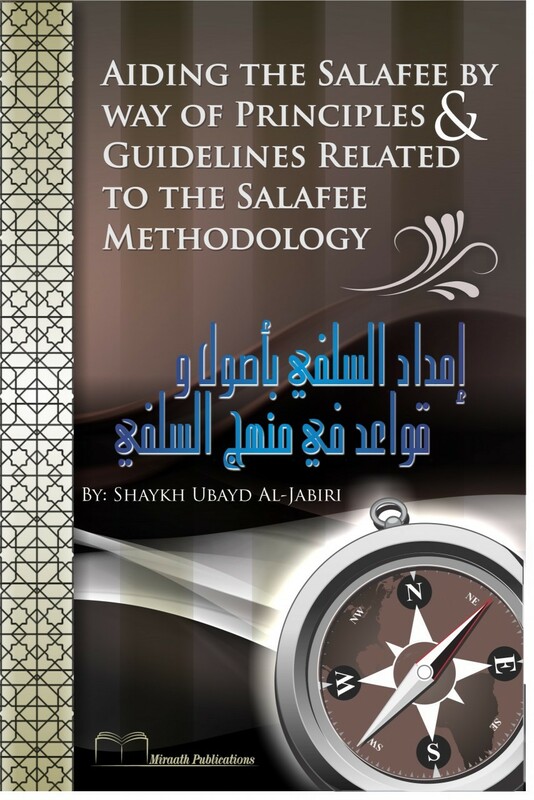 What is the difference between the Sunni and the Salafi? “It is allowable to make a supplication for a person that they be blessed. The correct way to do this is to say: ‘Baaraka Allaahu laka‘ or ‘Baarka Allaahu ‘alayka‘ and ‘hadhal amr mubaarak‘. The expression that is common upon the tongues of the general people is ‘Mabrook ‘ala fulaan‘ (may so and so be knelt upon); this is a blatant mistake and in opposition to the correct usage of the word in the Arabic language. Qn41: Is it permissible to hang the supplication of the traveler (du’aa of travelling) in the car so the people who haven’t memorized it yet can read it? 1. Iblees (Satan), may Allaah’s curse be upon him. 2. Whoever is worshipped and is pleased with that. 3. Whoever calls the people to worship them. 4. Whoever claims to possess anything from the knowledge of the affairs of the hidden and unseen. 5. Whoever judges by other than what Allaah sent down. This is the meaning of ‘laa ilaha illa Allaah’. This is pointing to the fact that it is obligatory to worship Allaah alone and sincerely without any partners, because the first thing that Allaah commanded the servants with was to believe in Allaah and disbelieve in at-taaghoot. Moreover, they are many but their heads are five. It means their leaders and those who a blindly followed by them. Iblees was with the angels, in their company and performing their actions. Then when he was commanded to prostrate to Aadam, the foulness, disdain and haughty pride within him was manifested and he refused to prostrate, became haughty and became from the disbelievers. So he was cast out from the Mercy of Allaah, the Mighty and Majestic. 2. Whoever is worshipped and pleased with that; he is the one who is worshipped besides Allaah and is pleased that he is being worshipped besides Allaah; he is one of the heads of the taaghoots and Allaah’s refuge is sought from that and it is the same whether he is worshipped in his lifetime or after his death, if he dies whilst having been pleased with that. 3. Whoever calls people to the worship of himself; it is anyone who calls the people to worship him, even if they do not do so. He’s one of the heads of the taaghoots whether the people responded to his call or not. 4. Whoever claims to possess anything from the knowledge of the affairs of the unseen and hidden; al-ghayb is whatever is hidden and unseen by man and it of two types: That which exists at present and that which lies in the future. What is hidden in the present is a relative matter, something may be known to one person and unknown to another. But the hidden and unseen of the future is something absolute and not know to anyone except Allaah alone, or to a messenger granted such knowledge by Allaah. So whoever claims such knowledge is a disbeliever. 5. Whoever judges by other than what Allaah has revealed; judging by that which Allaah, the Most High, sent down is from the tawheed of Lordship (ar-rooboobiyyah) since it is applying the judgement of Allaah, which pertains to His Lordship and His complete sovereignty and authority. Both of them mean utter debasement in front of Allaah the Mighty and Majestic and total submission to Him, openly and in secret. This comes along with perfect love for Allaah the Blessed and Exalted. Due to this, the Scholars divided between al-khashyah (dread) and al-khawf (fear). They said, “Indeed, al-khashyah is fear accompanied by glorification, whereas al-khawf can be accompanied by glorification and it can occur without glorification as well.” And this is true, since a person can fear an enemy. However, his fear of the enemy does not mean that he glorifies him. And he could fear a predatory animal, but his fear of that animal does not mean that he glorifies it. However, al-khashyah cannot be applied unless it is accompanied by glorification. Khasyah (awe) is fear founded upon knowledge of the greatness of the one whom you fear.It is something more particular than khawf. For example, if you fear someone but don’t know whether he is able to catch you or not, then this is khawf. But when you fear someone and know that he is fully able to seize hold of you then this is khashyah.